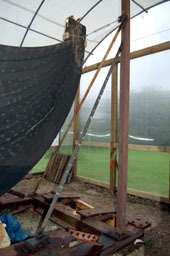 Since being moved from Lincoln Park in 1994, the Viking had been inadequately supported and poorly protected from the weather. Viking sagged and twisted out of shape. First, the shelter was extended eight feet and rigid walls were installed at each end to prevent the entry of bad weather. Tools of every size and sort were brought to the site. Extra electrical amperage was provided to power saws and grinders. 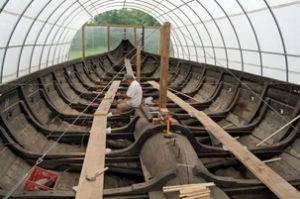 After first placing protective foam between the newer wood and the old, the preservationists carefully positioned long boards inside the Viking. Workmen gingerly walked along these boards while all work was being done. First came the thorough vacuuming. Then came the placement of the supports, both inside and outside. 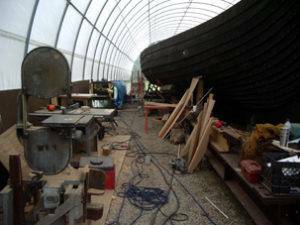 Working in conjunction with the adjustable supports welded to the outside and the cables, with turnbuckles, on the inside, gradually Viking was brought back to her original shape. 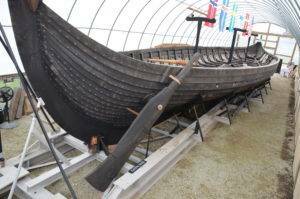 Viking’s stern end was twisted out of true alignment. The preservationists erected a tripod directly to the steel “cradle” and used strategically placed clamps and wire cables to bring the sternpost back into “true”. Copies of the original blueprints were used as a guide while “pulling” and “pushing” the Viking back into her original shape. In the years since the initial stabilization done by Robert Fink of Renaissance Yachts and a team from Methods & Materials in 2008, the Viking ship has endured the heat of the summer months and the below-freezing temperatures of winter. The outdoor environment and inadequate support has been detrimental to the ship. 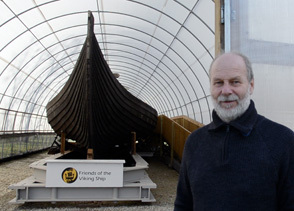 Concerned, in 2013 the FOVS brought Gunnar Eldjarn, of Tromso, one of Norway’s preeminent Viking ship builders, to evaluate the condition of Viking and give us his advice on how to preserve the ship. 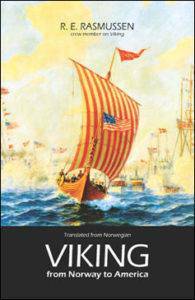 Mr. Eldjarn produced a report listing the measures we must take to better support the Viking ship. 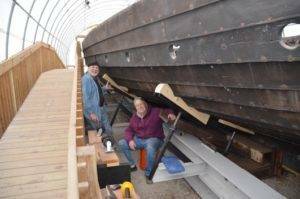 He has recommended that many more supports be placed under the keel and hull, and place it in a climate-controlled environment as soon as possible. In October, 2014, that work was begun. 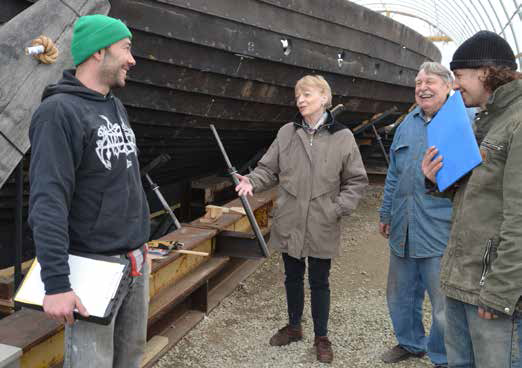 Ten additional steel crossbeams were welded onto the steel cradle to better support the keel of the Viking ship. FOVS committee members made all the arrangements, FOVS volunteers made the preparations, and professionals from Methods & Materials did the welding. In 2015 the necessary hull supports were welded onto the cradle, and temporary wood “pillows” were individually crafted following Gunnar’s design and instructions. Mr. Eldjarn visited our ship again in August of 2016 to evaluate the work that had been done, and to make recommendations on the remaining stabilization needed. It was especially gratifying to hear Gunnar as he inspected the new “pillows” providing a cushion between the metal support jacks and the ship, proclaiming them either “very good” or “excellent.” From September through mid-November, Bruce Andresen worked with Neil Anderson, Dave Barrows, Dave Nordin, and Perry Straw at the ship adding bow and stern jacks per directions from Gunnar, as well as removing cables and other original supports that were no longer needed. We can now proudly state that the stabilization work is now complete and Viking has the the best structural support she’s had since she left the water! We thank all those who have generously donated the funds in support of our stabilization efforts. 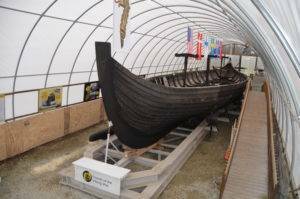 You can contribute HERE or contribute simply by shopping Amazon Smile OR iGive and choosing to support the Friends of the Viking Ship. We thank American Express and the National Trust for Historic Preservation for making this stabilization project possible.